Marais des Cygnes Valley sophomore Mitch Saffle, center, takes sub soil samples to determine texture during the FFA Land Judging Competition hosted by MdCV Sept. 19 near Melvern. 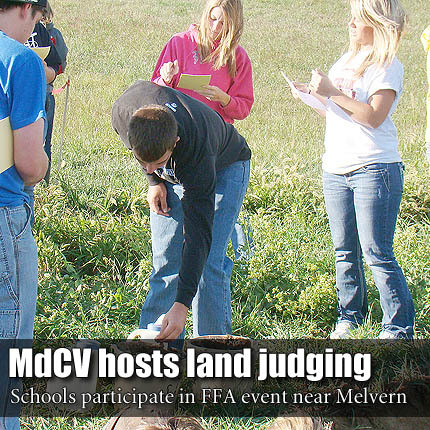 MELVERN—More than 200 local FFA members from 17 chapters gathered at the Melvern Community Center to participate in the East Central District Land Judging Contest Sept. 19. Competitors traveled from the community building to the a hay field east of town, owned by Kay and Larry Salisbury. Participants judged four separate holes and had a time limit of 20 minutes per hole – grading attributes including slope, soil texture, depth of the hole and amount of erosion. Participants returned to the community center to wait for scores to be tabulated. While waiting, many chapters ate pizza and bought pop and candy bars from concessions that were run by a few volunteers from the MdCV FFA chapter. Paola took the top team and individual spots, with MdCV placing seventh overall. Julie Heslop was the top individual finisher for MdCV, tying for 10th place.